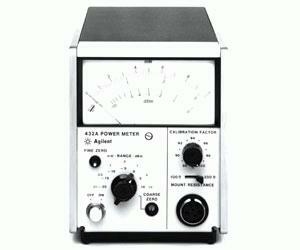 The Agilent 432A provides high accuracy over a wide temperature range. By measuring the output voltage of the thermistor bridges and computing the corresponding power, even higher accuracy of ±0.2 percent ±0.5 microW can be obtained. Accuracy can be maintained on even the most sensitive range because the error due to thermoelectric effect is reduced to a negligible level. Thermistor sensors are required for operation of the 432A.